Hillary Clinton as a kindergarten teacher? 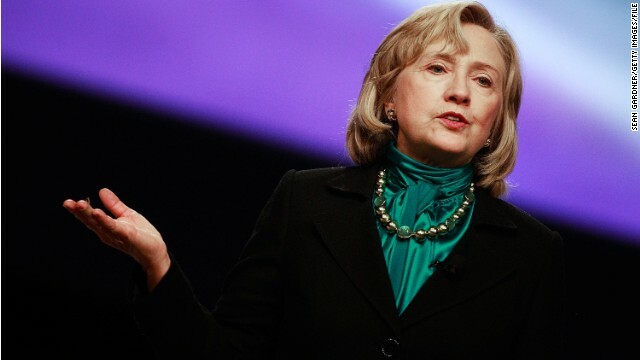 Fayetteville, Arkansas (CNN) – Hillary Clinton, a woman who's held two of the highest offices in U.S. government, may have originally wanted to become a kindergarten teacher after her eight years as first lady. The revelation was found in the copious notes and diary of Diane Blair, a close friend and confident to the former first lady. In a diary entry dated June 23, 1994, Blair expresses concern that going negative on Congress would backfire on the Clinton administration and, particularly, on Hillary Clinton. "End of BC's [Bill Clinton's] success with Congress and all be blamed on her," writes Blair. Blair goes on to note that Hillary Clinton, while appreciative of her input, said she wasn't worried about future relations with Congress. According to Blair, Clinton told her that when the Clintons are done with "this," the first lady will "go be a kindergarten teacher and never have to hold hands on the Hill again." Nothing could be further from the truth, however. Clinton would go on to serve eight years in the U..S. Senate, four years as secretary of state, and is now considered the frontrunner for the Democratic presidential nomination in 2016. That exchange is among thousands of pages of notes, letters, and diary entries penned by Diane Blair, a political science professor and longtime Clinton friend whose papers were donated to the University of Arkansas after her death in 2000. Blair worked on Bill Clinton's two presidential campaigns and advised the President and first lady throughout their eight years in the White House. In particular, she was very close with Hillary Clinton, who called Blair her "closest friend" in her 2003 memoir "Living History." CNN has confirmed the documents are authentic and has reached out to a spokesman for Hillary Clinton, who has not responded. There is no way to independently confirm the accuracy of Blair's specific recollections and direct quotations of the Clintons. Secretly, Hillary Clinton fears that Cory Booker will rise and take the 2016 Democratic presidential nomination from her. Ugh... the thought of her being that influential in a child's formative years is repulsive. Why? Her daughter turned out quite well. Uh huh... probably took after the nanny that raised her. Riiiigght, because heaven knows, "libruls" NEVER raise good kids on their own! LOL – so many clown cars! You have to remember that the extreme Radical Right mostly thinks all liberals are non-Christians (in their opinion) and so are raising little devil worshiper children. Once the New Theocracy is set up, this won't be a problem, as public schools will be converted to science-free faith fun centers. "Uh huh... probably took after the nanny that raised her." Oh come on. That's a pretty disgusting low blow, Fair. Are we to believe that you have similar misgivings about Laura Bush's motherhood and the quality of the nanny she passed all her mothering responsibilities to, in light of the frequent reports of her daughters' misbehaviors while Dubya was playing POTUS? Keep it above the belt. Actually, I do, Sniffit. My opinion (and it's MY opinion) is that if parents are going to completely abdicate their responsibilities as parents for whatever reason, perhaps they should question their motivations for having children in the first place, since the child deserves to be the number one priority. I don't think that opinion is out of the mainstream, do you? "Actually, I do, Sniffit. My opinion (and it's MY opinion) is that if parents are going to completely abdicate their responsibilities as parents for whatever reason, perhaps they should question their motivations for having children in the first place, since the child deserves to be the number one priority. I don't think that opinion is out of the mainstream, do you?" Except I don't think either of those women or the ones who came before them "completely abdicated" their responsibilities as parents. You assume they did but in reality know absolutely nothing really about their relationships with their children. I think it's a rather sad and cynical premise, particularly in light of the fact that from all indications, all three of those daughters...and now Obama's two as well...turned out well adjusted, got great educations, seems to be close with their parents, etc. Anyway, nobody attempted that line of argument on Laura....it only seems to come up with conservatives when they want to play to the undercurrent of s-xist anger and stereotypes in their base about the feminist movement and destruction of the "family unit" and "family values" that supposedly results from "uppity women who decide to have a career instead of staying home to raise my brood and make me my sammiches."